What’s the best way to to prevent fraud or mistakes in the finances of your homeschool group? 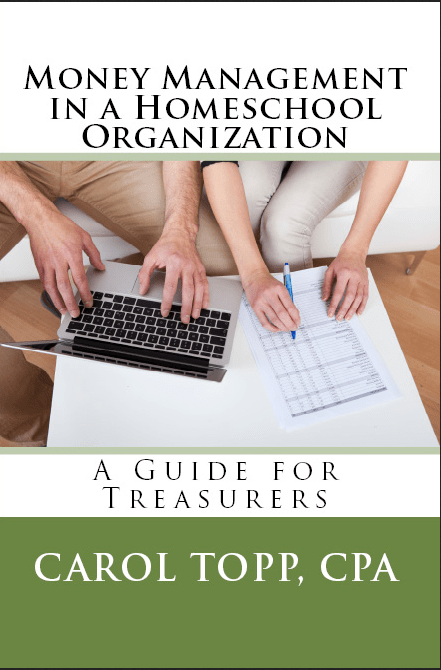 It’s called separation of duties and Carol Topp, the HomeschoolCPA explains why your treasurer should not be doing all the financial tasks in your homeschool organization. In this 12 minute podcast episode Carol explains how you can separate and share the money management tasks. In the podcast Carol mentioned a list of suggestions to prevent fraud. I received a phone call from a homeschool support group leader that broke my heart. She had just learned that her treasurer had embezzled over $10,000 from her group during the past two years. Her tale was heartbreaking as she spoke of what painful lessons she had learned and how to go forward. The treasurer’s business income had taken a recent financial hit making his personal finances in trouble. The treasurer was not detailed oriented. The treasurer did the bank reconciliation, so no one else saw the bank statements.The checkbooks was kept locked in the treasurer’s business office and frequently inaccessible. 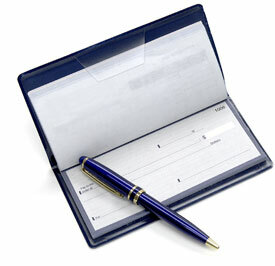 The leader had a difficult time getting the treasurer to write checks to members for expenses. The treasurer was married to the vice chair, who was a close friend of the leader, so the leader was reluctant to confront her friends. The board was small and few people were willing to volunteer, making the leader desperate and grateful when anyone said they would serve as treasurer. Consulting with a lawyer about criminal prosecution. Pursuing restitution from the treasurer. Using a bank account with on-line access for visibility. Having someone besides the treasurer do the bank reconciliation. Amending bylaws and policies to add accountability. The treasurer will be required to make financial report at every meeting. I hope you never face a similar situation. To prevent fraud in your homeschool group, follow the practices mentioned above and in my book Money Mangement for Homeschool Organizations which you can order from the Bookstore page. I also offer an excerpt from the book, a list of Recommended Financial Practices in the Chapter titled Fraud: It Couldn’t Happen to Us. It’s so important that your homeschool group put in place good financial oversight that I’m offering that part of the book at no charge. Hint: When CPAs talk about “controls”, we mean the practices and policies that will help your organization avoid fraud and catch mistakes. 1. The first and most important consideration is to set the control environment, that is, to let everyone know, from the top down, that there are policies in place and everyone has to follow the policies. In so many organizations the top person makes exceptions for himself or herself about policies, which sets a sloppy or even unethical tone. Then other people don’t think they have to follow procedures, either, and they start cutting corners. Emphasize the importance of ethics and controls at staff meetings, and demonstrate that everyone follows the rules, all the time. 2. Define clearly who is responsible for what. It’s very common in small organizations, where not as much needs to be written down, for people to say, “I thought she was going to check the invoice.” For example, with invoices: who is responsible for checking the math? Who is responsible for approving the invoice to be paid? 4. If there’s cash involved — such as at a fundraiser or box office at a performance — have two people count all the cash together. 5. Reconciling the bank statement is a very crucial step. It’s very unlikely that someone is going to steal from you and run away forever. Reconciling the bank statement means that embezzlement can’t go on for very long. Ideally someone other than the bookkeeper (or whoever handles the money) reconciles the bank account from an unopened statement. That’s a strong check on the person who handles the money. But in a small nonprofit there may not be a bookkeeper, and there may be only one person who does everything. In these instances someone else, such as a board member, should receive the unopened bank statement, and look it over before giving it to the bookkeeper or the sole staff person. Want some advice specific to homeschool groups? You can find it in my new book, Money Management in a Homeschool Organization. Get help from an attorney, a CPA with fraud experience or a certified fraud examiner. If an investigation is warranted, says Allan Bachman, education manager of the Association of Certified Fraud Examiners, it should be conducted by a trained professional and not by group members with no training in such matters. Resist the temptation to confront the suspect. If you try to handle the matter internally, you could put yourself and your group at risk for liability. Contact the police when advised by your lawyer. This is an agonizing decision, but it should be made based on the evidence, not your personal relationship with the person you suspect. Cooperate with the authorities. The police will review evidence, question the suspect, and determine whether he or she should be charged. If police decline to pursue the case, your attorney can advise you on a civil suit. When communicating with your group, focus on the steps you are taking to recover the money and prevent theft. Do not comment on past actions, including the alleged theft and any current or pending charges, unless the person has been convicted. Please do not let embezzlement go unpunished. The guilty party will just go onto another organization and could do more damage. Seek to get the embezzled funds paid back to you. [i] Ghezzi, Patti. “Protect Your Parent Group From Embezzlement.” PTO Today. http://www.ptotoday.com/pto-today-articles/article/1180-protect-your-parent-group-from-embezzlement. Accessed October 29, 2013.